Leaderboards add-on will add the “Leaderboards” submenu under the GamiPress menu. Accessing to this menu you will be able to start configuring leaderboards similar to WordPress post/pages views. 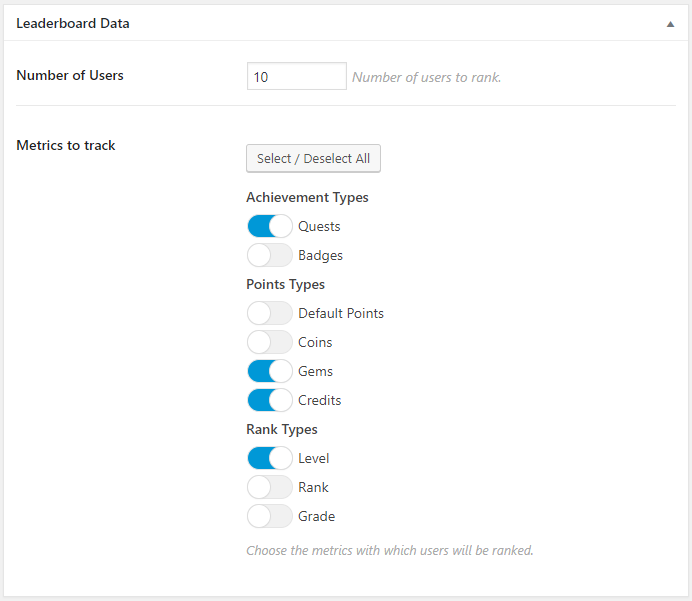 First you will need to configure how internally the leaderboard should track to rank the users. Maximum number of users to rank. The metrics with which users will be ranked. Automatically they will be ranked by the most high value of each metric selected. If you want, you can filter the leaderboard to use the metrics to track from a specific time period you want. 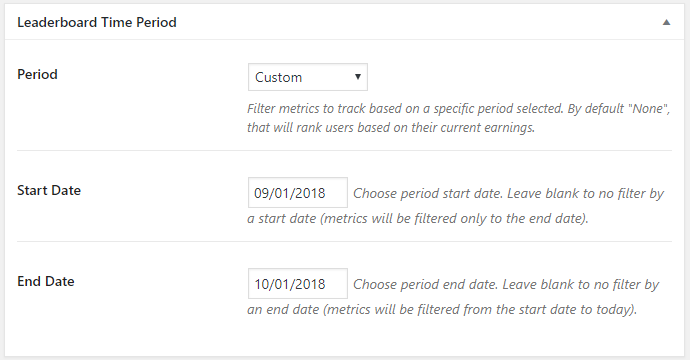 Filter metrics to track based on a specific period selected. By default “None”, that will rank users based on their current earnings. Available options: None, Today, Yesterday, Current Week, Past Week, Current Month, Past Month, Current Year, Past Year and Custom. Custom period start date. Leave blank to no filter by a start date (metrics will be filtered only to the end date). Accepts any valid PHP date format. (More information). Custom period end date. Leave blank to no filter by an end date (metrics will be filtered from the start date to today). 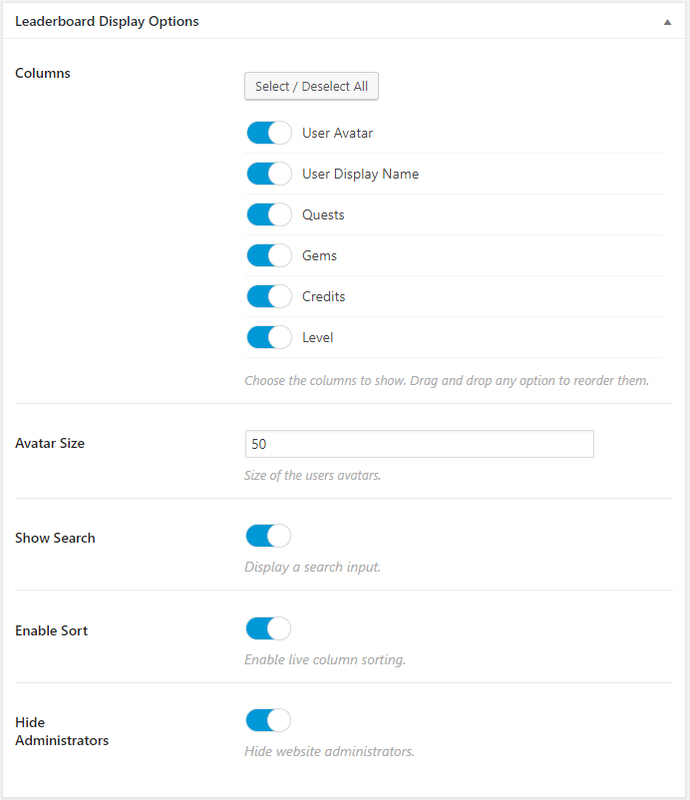 From the Leaderboards Display Options box you will be able to set which columns will be showed to the visitors and enable/disable the frontend live functionalities. From this option you can choose the columns to show regardless of the metrics selected. This means you are able to choose more metrics to track than the columns to be shown to visitors. Also you have the ability to drag and drop any option to reorder them. Check this option to display the live search input (you can override this option in [gamipress_leaderboard] shortcode and in GamiPress: Leaderboard widget). Check this option to enable live column sorting (you can override this option in [gamipress_leaderboard] shortcode and in GamiPress: Leaderboard widget). Check this option to hide website administrators (you can override this option in [gamipress_leaderboard] shortcode and in GamiPress: Leaderboard widget). 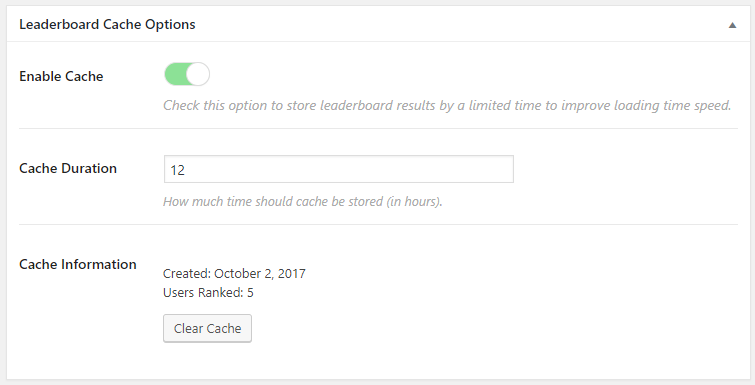 From the Leaderboards Cache Options box you will be able to configure the leaderboard caching results functionality, something really important if you want to show a large leaderboard (more than 100 users). Check this option to enable the caching results functionality. How much time should cache be stored (in hours). From this area you will be able to see where the cache has been created as well as the number of users stored. Also you will be able to manually refresh the cache if you are testing it, if not, then it will be refreshed automatically based on the Cache Duration option. From the Leaderboards settings page you can enable/disable the ability to access to a leaderboard as a page. If you disable it, Leaderboards has the [gamipress_leaderboard] shortcode that allows you to place a leaderboard anywhere, including in-line on any page or post. 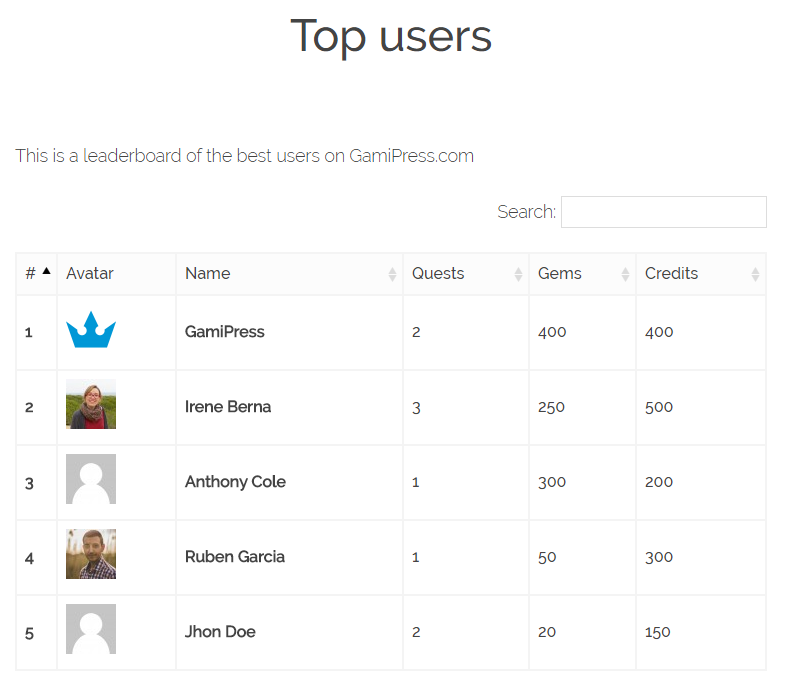 Also you can place any leaderboard on any sidebar through the GamiPress: Leaderboard widget.